The Down Etc. 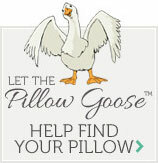 � Diamond Support Pillow contains 95% duck feathers and 5% duck down. This unique combination allows the Down Etc. � Diamond Support Pillow to provide comfortable support night after night. Additionally, the Down Etc. � Diamond Support Pillow is encased in a unique double layer of quilted fabric guaranteeing that no feathers will poke out while you are sleeping. Immediately after receiving this pillow you will be impressed by Down Etc. � Diamond Support Pillow�s fine construction. The design creates a heavier, more substantial pillow. There is no doubt that you will have a great night of sleep when you lay down upon the Down Etc. � Diamond Support Pillow. The Down Etc. � Diamond Support Pillow�s internal combination of feathers and down with a quilted cover will provide you true comfort. Order the Down Etc. � Diamond Support Pillow from Down Pillows today and enjoy a great night�s sleep!